* Day 1 and Day 2 are priced separately, but can both be purchased. 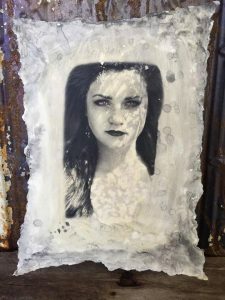 The first half of the day you will learn the unique, ethereal process of photo transfers on French deckled paper. You will leave with your own piece of fine art and the knowledge to use this method on wood, walls, cupboards and fabric. The second half of the day, we will learn the beautiful art and secrets of Vintage Tea Boiling. We will wrap bundles of treasures; papers, photo copies, letters, recipes, book pages, fabric and metal. You have to see to believe. These can then be used as cards, letters, transfers, labels and in journaling. (Inspired by Orly Avineri, and with permission to share). For this class bring some textured papers, letters, cards, cotton or silk fabric pieces. No art experience is necessary! Learn this unique process of aging wood by texturizing and crackling, using wood putty, chalk paint, and antique wax. This method will enhance any room and can be used on doors, chests, kitchen cupboards and much more. I did my entire kitchen in this method. It looks like an old French bakery. The second half of the day we will bend silver plated vintage spoons. You will leave with new knowledge to beautify your home in a rare and unique way. 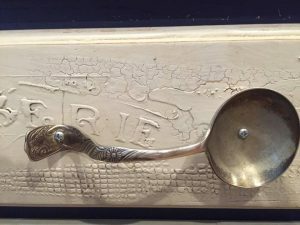 Leave with a piece of vintage wood and bent spoon to hang your coat or hat on, keys or hot pads. So much fun.